The parents of a three-year-old girl from Thornhill, Ont., want it to be legal for them to treat their daughter's epilepsy with an oil made from marijuana. "She was kind of like a bag of Jell-O," says her mother, Reagan Repetski. The first drug she was prescribed — Sabril — only managed to control her seizures for about a month. The next one was a steroid called ACTH, which her parents say caused her to gain half her body weight in three weeks. Disappointed at the lack of treatment options, Alex reduced his work hours and dove down the research rabbit hole. That's when he first read articles online about the success some people said they were having in reducing epileptic seizures with cannabidiol, one of several active cannabinoids found in the marijuana plant. Cannabidiol, or CBD, doesn't cause a high and, when mixed with an oil, has been widely touted as a potential therapy for hard-to-treat forms of epilepsy. But many doctors say there's little medical evidence yet to show if the compound is effective or even safe. Dr. Orrin Devinsky, a researcher at New York University's Langone Comprehensive Epilepsy Center, has done a safety study on the use of an extract of cannabidiol. Devinsky looked at the daily seizure logs of 137 patients, most of them children, who took a drug called Epidiolex — a purified form of CBD — for three months. The number of seizures decreased by an average of 54 per cent from the beginning of the study to the end, Devinsky reported last month at an American Academy of Neurology conference. "These results are of great interest, especially for the children and their parents who have been searching for an answer for these debilitating seizures," Devinsky said at the conference. However, he cautioned that there's no way to tell how much of the seizure reduction was due to the placebo effect in which the person's condition improves because they expect the drug to work. Similar research by Dr. Kevin Chapman of the University of Colorado recently raised similar questions. Chapman checked records of 58 young patients who used various types of CBD oils and found less than a third reported a significant seizure drop. Richard Wennberg, a neurologist at Toronto Western Hospital and a professor at the University of Toronto, agrees that the placebo effect is higher in epilepsy trials compared to many other treatment trials. "I'm open-minded, but hugely skeptical," Wennberg says of the supposed miracle marijuana-based drug for epilepsy, a condition that affects one in 100 Canadians. Epilepsy is complicated and sometimes a drug works, he says, but then it stops and the seizures return. Sometimes the seizures stop naturally, but come back. Sometimes they stop forever. "It's like playing whack-a-mole," he says. People are desperate for an effective treatment and, Wennberg says, that points to failure in drug development. "No more than 50 per cent of people with epilepsy have their seizures fully controlled with medications now," he says. "There is a huge need for something better." Alex Repetski says research and drug approvals take a long time — time his daughter doesn't have. Back in mid-2013, encouraged by what he learned during his research, Repetski tried to convince Gwen's doctors to treat her with marijuana, but they refused. He even considered moving his family to Colorado, one of 11 U.S. states that allows limited access to some cannabidiol-containing products. One of those products has become known as Charlotte's Web, named after a five-year-old wheelchair-bound girl who had an incurable form of epilepsy called Dravet Syndrome. Charlotte, whose story has been widely reported around the world, had to be fed through a tube while suffering 50 seizures a day. According to reports, her seizures were dramatically reduced after she started using oil extracted from a strain of marijuana developed by five Colorado brothers, the Stanleys. Several years later, the reports say, Charlotte has only one or two seizures a month. While extracting oil from marijuana is illegal in Canada, new legislation allows the development of the medical marijuana industry. Under the Marihuana for Medical Purposes Regulations, federal authorization to possess medicinal pot for patients shifts from Health Canada to physicians. After the new law went into effect in March 2014, the Repetskis asked several doctors to authorize the use of pot for their daughter. One of them agreed. There was still one problem: Gwen was a young child and couldn't smoke or vapourize the pot, so her father learned how to make marijuana oil in his kitchen. He then sent the oil to a lab for testing before giving it to his daughter three times a day. She hasn't had a seizure since, he says. "We saw a massive improvement — now she's crawling and feeding herself," he says with a broad smile. She even says "mama" and "dada." Gwen's last electroencephalogram in January showed no epileptic brain activity, Alex says. One of Gwen's doctors is also impressed. "Since she started, I have seen a remarkable improvement," says the doctor who does not want his name published for fear he'll be deluged by people requesting prescriptions for pot. One of the girl's physiotherapists, Bernadette Connor, says she's also seen "dramatic improvement" in Gwen's motor development and her spatial awareness since the girl started using marijuana oil. Repetski knows that what he's doing for his child is illegal. Before going public with his story, he sought advice from his friend, criminal lawyer Daniel Brown. Brown explains that Gwen's doctor signed an exemption allowing the girl to take marijuana, but there are strict rules surrounding that exemption. "As soon as he converts it to a different form, such as oil, the exemption no longer applies." That leaves the Repetskis in possession of marijuana and, since they give it to their daughter, they are trafficking it, Brown says. It's unlikely police would charge Alex Repetski, says Brown, but he agrees it's still a risk. If that happens, Brown says he would defend his friend in court by arguing the charges are unconstitutional. A similar case is currently before the Supreme Court of Canada. Owen Smith, of Victoria, was charged with trafficking for selling marijuana oil and cannabis-infused cookies — instead of just dried marijuana — to those with medical marijuana exemptions. A British Columbia Supreme Court judge said the regulations violated the Charter of Rights and Freedoms, a decision that was upheld by the Court of Appeal. The federal government asked the Supreme Court to weigh in, and a decision has yet to come. A Health Canada spokesman says the processing of marijuana into other products, including marijuana oil, falls outside of the scope of the Marihuana for Medical Purposes Regulations. Sean Upton says the regulations simply mean the only thing available is dried marijuana. "In theory, maybe Health Canada could possibly do something about somebody busting it down, but I don't think so," Upton said. "Look, there are a lot of parents who are doing this with nobody trying to stop them." 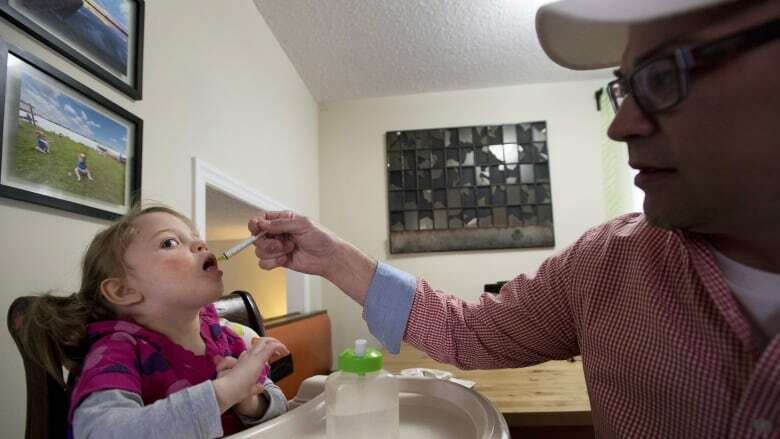 The Repetskis hope the laws will eventually change to allow parents with children like Gwen to legally access medical marijuana oil. Alex Repetski is such a believer in the treatment that he now works for MedReleaf, the company that sells him Gwen's marijuana. Back in their home, Gwen bounces from toy to toy in the family's living room. The floor is covered with thick black gym mats for her protection. "Hopefully, if she remains seizure-free, she can keep getting better and better," says her father.